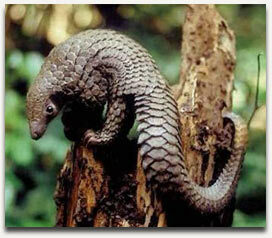 Pangolins, also known as scaly anteaters, are shy, nocturnal creatures that live mostly on ants and termites. All eight species of pangolin are listed on International Trade in Endangered Species (CITES) Appendix II, with an additional prohibition in any international trade in the animal. It is the scales of the pangolin that are traditionally used in Chinese medicine.